Setting out on a One Year Art Process is a bit like deciding you want to travel for a whole year. You have an idea of some of the places you want to visit, but you don’t know exactly where you’ll go, or how you’ll get from one point to another. The only thing you’re sure of is that you’re ready to begin your journey, and that by the time you return, you’ll be a changed person. You create because you have these urges, because your fingers want to merge with the scissors in your hand. Somewhere within you wants to express itself; you cut and shape and form as a release. Desire fuels creation, but the fear of failure can be a stronger force. Sharing your art requires giving as well as receiving. Misinterpretation, judgment, silence, can be the return for the creative self-revelations you offer. And if this is the way it’s going to be for 50 more weeks, then you better get used to it. You create because you’ve made a commitment to yourself. These creations you share, you do so with delight. You create for yourself. You are the most important audience here. Chaque semaine, c’est le même travail, la même énergie à donner et, en vérité, ce n’est jamais pareil. Les gestes se ressemblent, les photos aussi et pourtant c’est une autre histoire à chaque étape. Une rigueur, un rythme à trouver, un stress parfois à gérer… Une façon aussi d’honorer cette part de moi-même, de créer plus d’espace au sein de mon imagination. Sorte de journal créatif, le thème, le sujet, l’obsession se dévoile au fil du temps, parfois en filigrane d’autre fois de façon plus explicite. Se perdre pour mieux se retrouver au final. Faire à la dernière minute, avoir peur de montrer, angoisse de la page blanche … Pour évoluer vers : me faire confiance, sentir le processus et m’amuser de mes impatiences ! 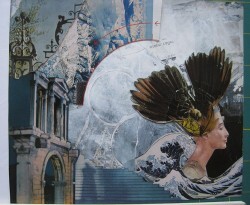 How does a collage come together? Most of the time it begins only with the intention to create. As I’m looking through the pages of a magazine an image jumps forth. I cut it out, then begin to create a new set of relationships using this image. The process is intuitive. I feel, I cut, I assemble, I rearrange. The cycle repeats itself until there is a moment of arrival. This arrival can come after days of working through different iterations, using different pieces of images. Sometimes nothing seems to work; different ideas are competing with each other. Then a central idea starts to take shape but it still needs resolution. I keep looking for resolution and what happens often is the birth of another collage: while I’m building on what I think is the main piece, there on the sidelines, midst the cutouts that didn’t fit are the ingredients for a completely new collage that arises seemingly spontaneously. I love these moments which are truly part of the magic and joy of creation. “I want that!” is something you might say to state your preference of an entree at a restaurant. To hear it spoken by spectators in a museum gallery is to bring another level of meaning to this phrase; it’s a telling remark as to how we as a culture identify and connect to art.